Both the igGrid and igHierarchicalGrid controls feature column summaries in the grid. Column summaries are available to expose a number of aggregations on a column including minimum, maximum, average and summation values. Further information regarding the classes, options, events, methods and themes of this API are available under the associated tabs above. 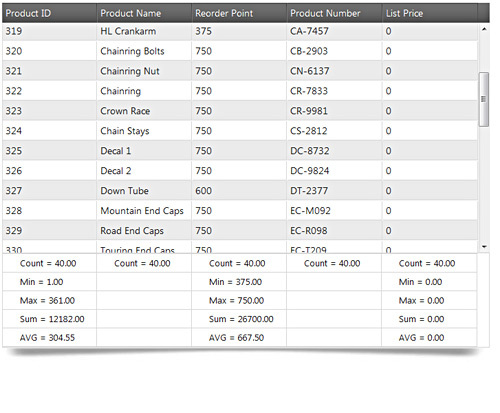 Specifies when calculations are made. .
summaries are updated when checkbox is checked/unchecked . summaries are updated only when OK button is clicked. Function reference - it is called when data is retrieved from the data source. A list of column settings that specifies custom summaries options per column basis. Enables disables summaries for the column. Column index. Can be used in place of column key. The preferred way of populating a column setting is to always use the column keys as identifiers. Column key. This is a required property in every column setting if columnIndex is not set. If it is false the summary operand will be shown in dropdown but it will not be made calculation. Specifies the number of digits after the decimal point for result of the current summary operand. This property will be ignored when isGridFormatter is true. Specifies whether to be used grid formatter for result for the current summary operand. Specifies the order of elements in dropdown. It is recommended to set order of custom operands and to be greater or equal to 5. Text of the summary method which is shown in summary cell. Name of the custom summary function which should be executed when type is custom. Set type of summary operand . calculate count of result rows for the specified column. calculate min of result rows for the specified column. calculate max of result rows for the specified column. calculate sum of result rows for the specified column. calculate average of result rows for the specified column. calculate custom function (specified by summaryCalculator property) of result rows for the specified column. Specifies how compact the summaries are rendered. When true indicates that the summaries may be rendered compactly, even mixing different summaries on the same line. False ensures that each summary type is occupying a separate line. . The number of digits after the decimal point. If gridFormatter is True then this option is ignored. Text of the button Cancel in the summaries dropdown. Text of the button OK in the summaries dropdown. Height of the dropdown in pixels. Width of the dropdown in pixels. Empty text template to be shown for empty cells. Get or set text that is shown in the feature chooser dropdown when summaries are hidden. Get or set text that is shown in the feauture chooser dropdown when summaries are shown. If this property is enabled and in summaryOperand isGridFormatter is undefined then use grid formatting for cells. Result template for summary result(shown in table cell). Show/hide footer button(on click show/hide dropdown). Show header button icon in the header cell. On click - shows/hides summaries. Tooltip text for header cell button. Result key by which we get data from the result returned by remote data source. Determines when the summary values are calculated when type is local. summaries are calculated prior to filtering and paging. summaries are calculated after filtering and before paging. summaries are calculated after filtering and paging. Set key in GET Request for summaries - used only when type is remote. when it is remote summaries calculations are made on the server. When it is local calculations are made on the client. Event is fired when Cancel button is clicked in drop down. Use ui.columnKey to get column key for which Cancel button is clicked. Use ui.owner in order to access the igGridSummaries widget object. Use ui.columnKey to get column key of the column where drop down is closing. Return false in order to cancel closing the drop down. Use ui.columnKey to get column key for which OK button is clicked. Use ui.columnKey to get column key of the column where drop down is shown. Return false in order to cancel opening the drop down. Use ui.columnKey to get column key of the column where drop down is opening. Return false in order to cancel calculation of summaries. Use ui.isToShow to get whether summaries are shown or not. Return false in order to cancel showing/hiding of summaries. Summary calculate the whole data for the specified column key, columnMethods and dataType (used when datasource is remote and dataType is date). Array of column methods objects. represents dataType for the current column. Remove all summaries dropdown buttons. Returns whether summaries rows are hidden. Specifies the jQuery object for checkbox. Specify whether to select or not checkbox. jQuery object representation of dropdown div element. Return a JQUERY object which holds all summaries for column with the specified column key. Return a JQUERY object which holds all summaries for all columns. Toggles the checkstate of a checkbox if checkboxMode is not set to off, otherwise does nothing. Specifies the jQuery object of the checkbox. toggle drop down for the column with the specified key. event object. Its data should contain current columnKey, isAnimating, buttonId. Specifies whether to show or not summaries. Optional parameter.Specifies whether this function is called internally by the widget. Class defining the hover state style of the checkbox. Classes applied to container which holds all checkboxes in dropdown. Classes applied to list item in the dropdown. Classes for icon to be showin in the feature chooser. Classes applied to footer button icon(which show/hide dropdown). Classes applied to footer button icon when selected(the dropdown is opened). Classes applied to footer button icon when hovered (button show/hide dropdown). Classes applied to the container of OK/Cancel button in dropdown. Classes applied to footer row cell. Classes applied to footer row cell when it is hovered. Classes applied to DOM element which contains text for icon in the summary cell. Classes applied to DOM element when showSummariesButton is false. Classes applied to DOM element in the summary cell which contains text for summaries result. Classes applied to DOM element in the summary cell which contains text for summaries result when showSummariesButton is false. Classes applied to the container div of header button(which shows/hides summaries). Classes applied to the header button(which shows/hides summaries). Classes applied to the header button when hovered(which shows/hides summaries).